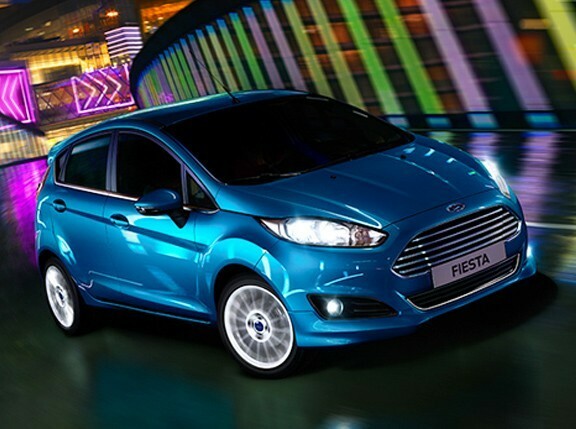 The Ford Fiesta ST is a celebrated blue-collar performance hero. But the next-gen ST has had a heart transplant. So has the icon lost its soul, or is this new breed a welcome piece of fresh thinking? We join the development team at Ford's top-secret test facility in Belgium to experience it. Spoiler alert: This is one little car that punches way above its weight. 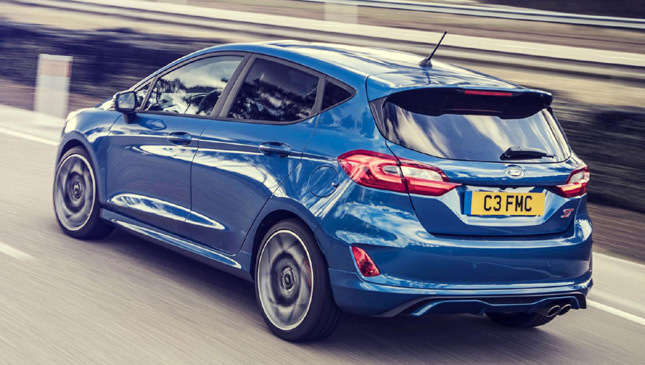 Using witchcraft and fairy dust, the ST's 1.5-liter three-cylinder turbocharged engine delivers 197hp and 290Nm of torque, firing the ST from 0-100kph in 6.7 seconds and on to a top speed of 232kph. Lighter and more efficient than its predecessor, the new engine should pay dividends when it comes to the handling. It's mated to a six-speed manual with a nice meaty weighting and short throw, plus there's an optional limited slip differential. The downsized motor also features cylinder deactivation, which, under light loads, shuts off one cylinder and adds frugality to the list of ST attributes. Fortunately, the shift from three cylinders to two is pretty much imperceptible. The ST also gets bespoke bi-compound Michelin Pilot Super Sport tires, with stickier rubber on the outside edge to optimize cornering and a more durable one across the main section of the tread. To further help turn in, there's torque vectoring, by braking the inside front wheel. 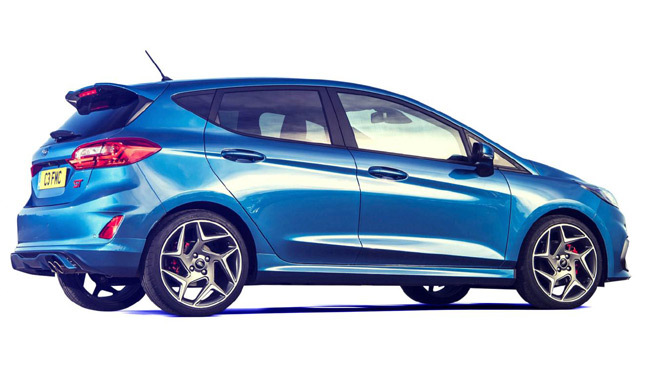 At the rear, the ST has twist beam rear suspension. 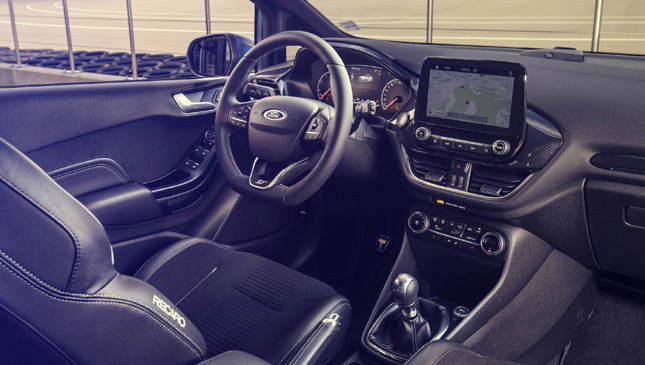 Inside the ST features optional Recaro bucket seats, which, in contrast to its big brother the RS, allow full adjustment down to a lovely low seating position. There's a chunky steering wheel, and nicely finished metal and rubber pedals. 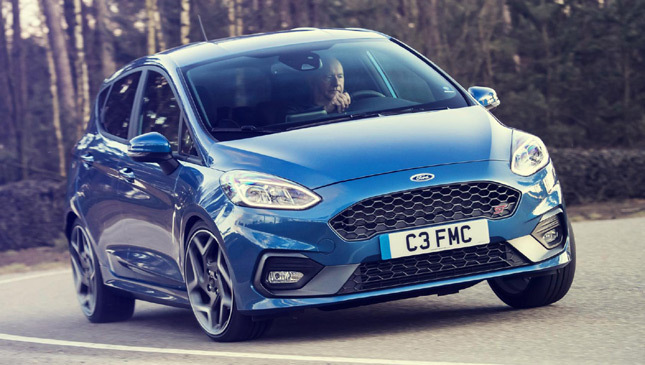 To give us the full display of the ST's dynamic capabilities, I was inserted into the passenger seat of a fully-specced racing blue ST. Options includes the LSD and a handy test pilot called Koen Bex who set off with a point to prove. As Koen got airborne over a particularly tricky series of humps, the first thing that struck me, beyond a sense of my own mortality, was that the ST sounds great. The warble is similar to a V6 and way better than any turbocharged four-cylinder could manage. 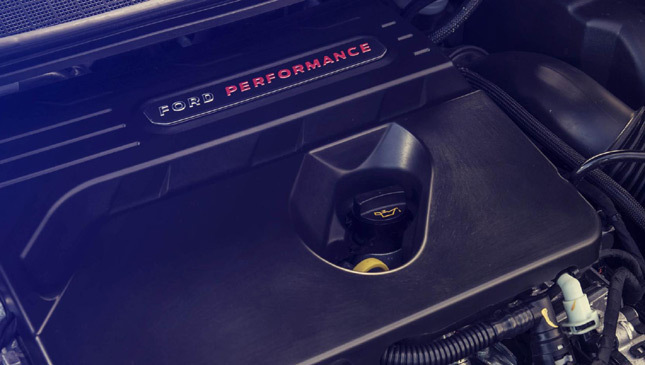 While some of the engine noise is enhanced through the speakers using Ford's ESE (electronic sound enhancement) technology, it's still convincing and characterful. The second thing that struck me from the passenger seat is how adjustable the ST is. Ford has kept the settings simple, as there are just three: Normal, Sport, and Track. Sport increases throttle response, steering weight, allows more slip angle, and adds more pops and bangs from the exhaust by opening the valve. Track disables the traction control further and allows even wider slip angles. You can disable the traction control entirely by pressing and holding the button in any of the settings. We're in Track as we crest another rise, and Koen lifts off allowing the tail to step out before burying the throttle and allowing the LSD and its torque vectoring assistants to work their magic, tuck the nose in and fire us onto the next long corner. The ST's pace is impressive. I suspect it could keep a supercar honest on a tight road, while adjustability on the throttle is extraordinary for a front wheel drive car. Koen rifles through the gears without lifting off the throttle, another ST trick that allows you to keep it pinned and flat shift. 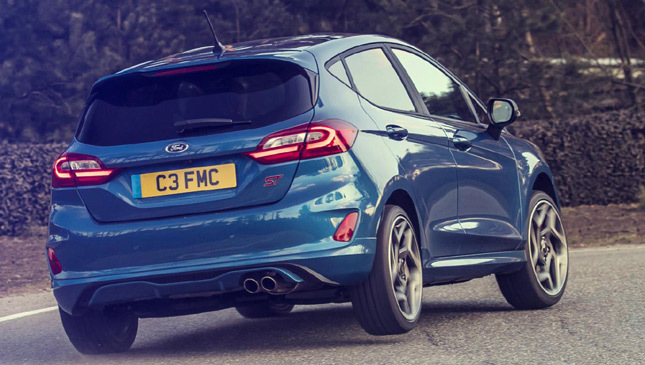 When not having its neck wrung by a test pilot, the ST has greater strength and depth than its predecessor, too. Ford has worked hard on NVH and ride comfort, and it shows. The all-new "frequency selective dampers" isolate the worst a broken surface can throw at you making it a far more relaxing car to cover distance in, but push the car harder and the dampers tense up to keep the body roll in check and hard wire the connection from road to the driver. 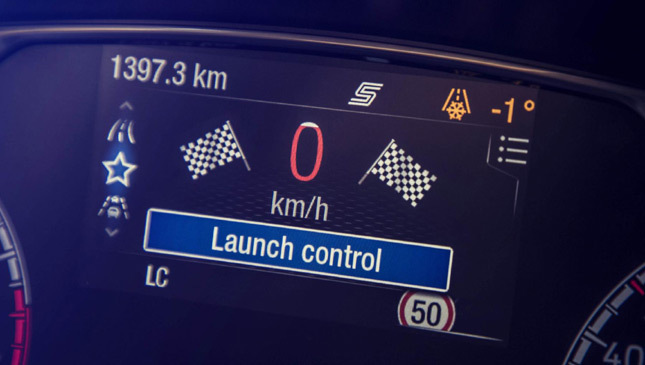 As part of the optional 'Performance Pack,' which features the LSD and a shift light, launch control is accessed through the steering wheel controls, and manages the power and torque delivery to ensure you leave the opposition standing at the lights. It remains activated until you deactivate it, or turn the car off and on again, so you can repeatedly launch to your heart's content, safe in the knowledge it's covered by the warranty. Normally we avoid passenger rides like the plague as they often frustrate and rarely reveal much about a car. But given the change in the ST's engine we were keen to make sure this little hero hadn't lost its way. 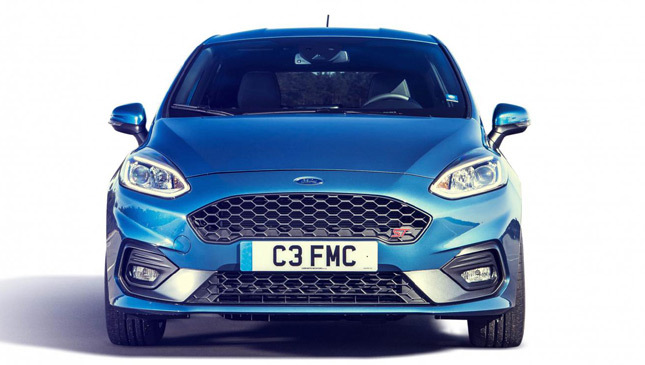 Our time with it had more than allayed our fears, as this could be the best fast Ford in a generation.